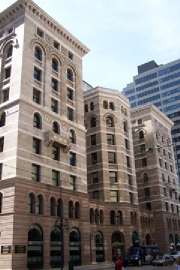 We are located in the historical Equitable Building in downtown Denver, Colorado. The Equitable Building was the most expensive and tallest building in Denver when it was built in 1892, and is significant for its role in the commercial and political history of Colorado. At the time of its completion, it was attributed with the development of 17th Street as a center of finance and business and has since served as the location for many distinguished businesses and law offices. To provide the best customer service possible through effective communication and real-time support. To offer sound guidance and strong technical expertise. To clarify regulatory obligations and facilitate compliance. We are proud to carry on this tradition of excellence. Mountain Air Consulting, LLC was established to provide efficient, expert solutions to businesses with air quality permitting and compliance needs. Our primary services include air quality permitting, regulatory compliance, dispersion modeling, and general air consulting. We also offer a host of specialty services to cater to the unique needs of our clients. Our staff serves a wide range of industries and are experts in the environmental issues and laws that impact our clients. Our staff offers the benefits of years of experience. We are an equal opportunity employer and are members in good standing of multiple professional organizations.